Take a look inside Bergsaker Hall! Bergsaker Hall is a first-year, co-educational residence hall. All rooms are wired with data and cable connections, and a wireless connection is available throughout the entire building. Named for A.J. Bergsaker, a former director of stewardship for the Evangelical Lutheran Church, this four story brick building is home to approximately 250 students. The building has a large recreation room, kitchen, laundry facilities, lounge areas, and a computer lab. 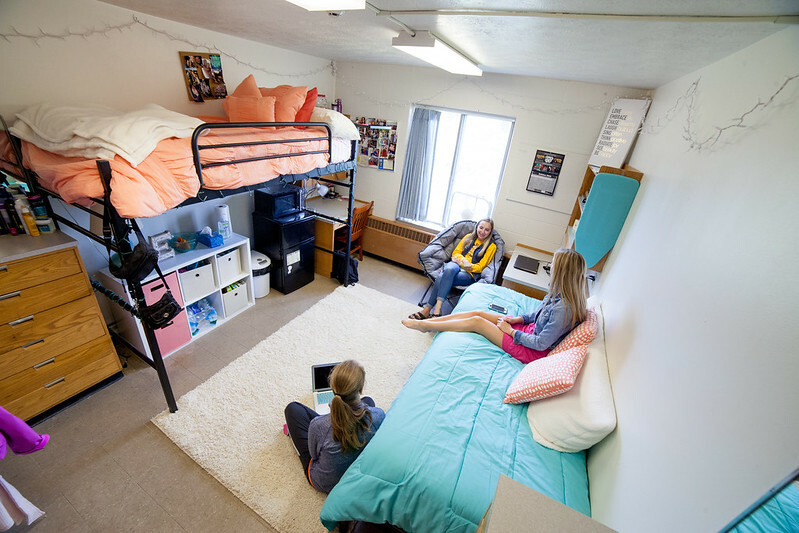 Bergsaker Hall rooms include a bed, which can be lofted, and twin extra lon mattress, along with a built in closet, dresser and desk. Scroll through the photos above for room dimensions. Enjoy excellent views of the campus green while you study, or visit with friends on the patio located off each dayroom. Bergsaker is staffed by seven Viking Advisors (VAs) and one professional hall director. While you can usually find staff in the hall throughout most any day, designated VAs are required to be in the building and accessible to students every night after 7 p.m.